Picture yourself being outside in a garden on a warm sunny morning. Nearby, birds are singing and flowers are blooming. This is a perfect space to unroll a yoga mat and embark on some ‘sun salutations’. So why not create a yoga garden? You can do this using some design ideas I offer in the book, ‘Heaven is a Garden – Designing Serene Outdoor Spaces for Inspiration and Reflection’ (published by St. Lynn’s Press). 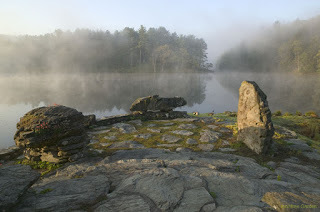 Innisfree garden in NY – please visit! Just as yoga allows us to ‘tune into’ our bodies, serene gardens help us get in touch with nature’s calming energies. 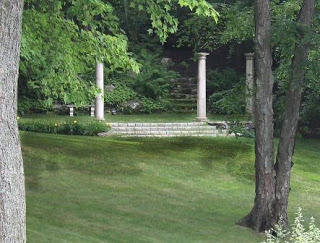 Any outdoor setting, no matter the size, can become a place of quiet beauty. 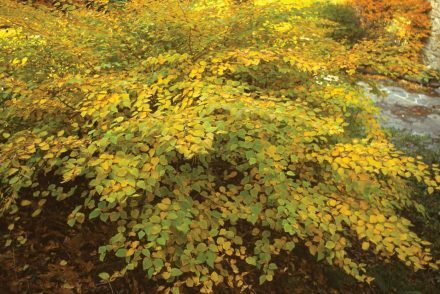 It should be partially sheltered, out of the wind and be bathed in gentle sunlight from east or southeast or dappled shade. I suggest you aim for ‘simplicity, sanctuary and delight’. Bedrock Gardens – please visit! Simplicity means clean lines such as slow curving walks or plant beds. Sanctuary refers to a a sheltered corner formed by a hedge or tree where we feel protected. And delight is anything that gladdens your heart. 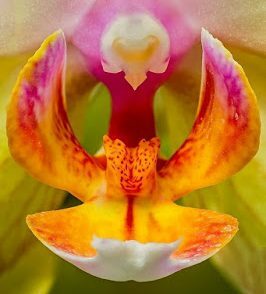 This can be a patch of flowers, outdoor art or a trickling water fountain. 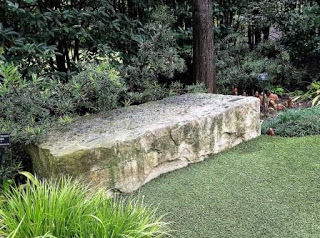 And of course, you can utilize nature’s nurturing qualities by carefully placing a large rock or stone sculpture within your backyard. 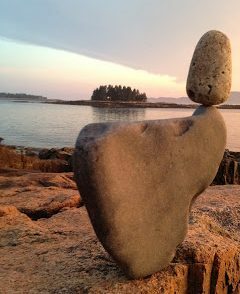 The natural ability of stone to ‘ground’ us was well known to ancient cultures and we are now rediscovering this wonderful idea. Additionally, the colors blue and green induce calm and add a feeling of restfulness to any outdoor space. You can also paint a gate deep blue or add more green textured plants to your garden. 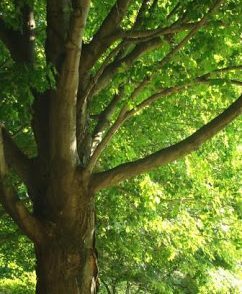 And, as I describe in my book, certain trees can add a beneficial and supportive energy to their surroundings. Lastly, we all respond to the fullness of a rounded shape such as a round finial or rounded planter. 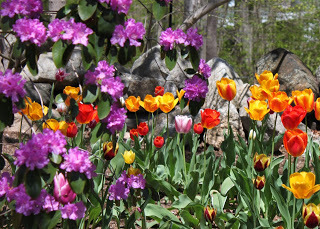 PJM Rhodys and tulips make a Spring garden sing. 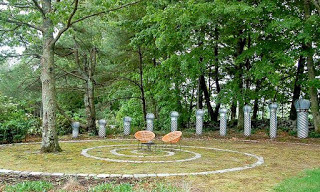 A yoga garden is a quiet place of renewal and contemplation and can be any size and in any locale. I have a small backyard where I added a curving ‘dry stream’ along one side. This stream hints at a waterway but there is no water in it. It is lined with rocks and contains decorative pebbles atop gravel. 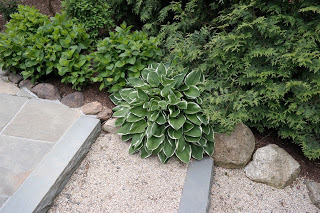 The plants that border it are the show as is the stream’s simple curved layout. 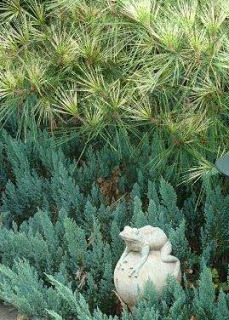 I used two-thirds evergreen plants and one-third deciduous plants, which follows the ideal proportion found in Japanese gardens. I firmly believe that a backyard designed to be a ‘little piece of heaven’ can remake ordinary time and space into something memorable, just as yoga does. Together, they can create some magic in your life. P.S. 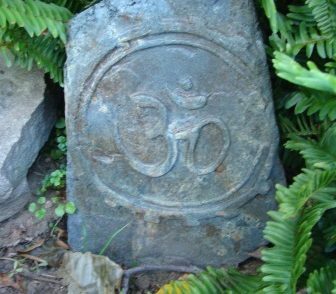 Check out my upcoming book, The Spirit of Stone – and use the grounding energy of stone in your new yoga garden! 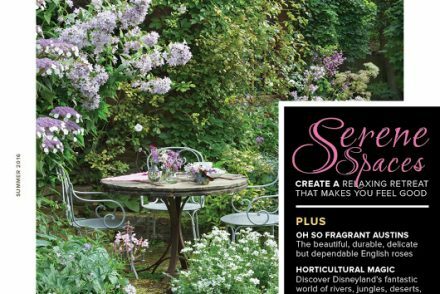 Win a free issue of Garden Design Magazine right here!